The Netherlands has made clear its intent to eventually mandate cofiring of biomass at all coal-fired power stations, and has indicated it will begin with cofiring obligations on power producers with possible obligations on power suppliers. An Indiana dairy will launch a new fleet of compressed natural gas-fueled milk trucks, once it completes construction on its new fueling station with a biogas conditioning element. A second biomass power proposal has emerged in the town of Klamath Falls, Ore., following the announcement that Iberdrola Renewables will amend its power plant proposal for the community from natural gas to biomass feedstock. The NEBTWG is encouraging members of the biomass industry to submit their thoughts on the economic and environmental benefits of biomass energy in Vermont, so that biomass will be included in the state's Comprehensive Energy Plan. The Berlin Station biomass project in New Hampshire is officially off the table as a result of financial uncertainty created by project opponents, according to the project developers. The U.S. Forest Service Wood Education and Resource Center is leading the way in rediscovering that woody biomass is an efficient, cost-effective energy source by establishing a Woody Biomass Technical Assistance Team. 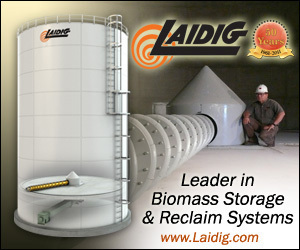 The American Biogas Council will host a webinar on July 12 at 1 p.m. ET, where industry experts will address state and federal policies that impact anaerobic digestion facilities.